I live in the south, so I wasn't too far off....right? I've been staying at the same hotel, every other weekend for 3 years when I go visit my kids. I've gotten to know most of the staff, and have become friends with some of them. I guess being friendly crossed a line. My fault for trying to save a few bucks and going to Cost Cutters I guess. Can anyone provide info on this helmet? A friend found it at an estate sale. Real or reproduction? Age? 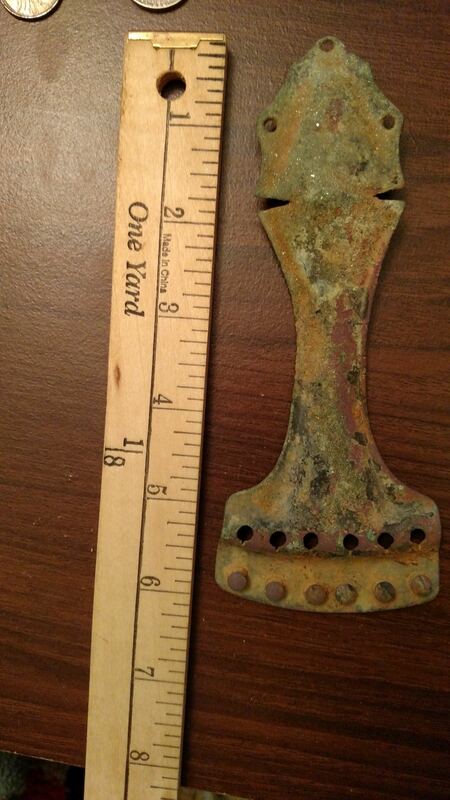 Found metal detecting in a field in rural VA.
Had this one dropped on me while looking for new permissions. Found this metal detecting. I assume it's play money, but usually it says so on there. Help me find exactly what this is? My searches have come up empty! Found while metal detecting in VA.
My mom wanted me to look through her silver dollars to see if there was anything special. Another found metal detecting, what is this? Found metal detecting in VA, quarter shown for scale. Found my oldest coin to date last weekend. 1723 Wood's Hibernia half penny. My dad and his friends caught these turtles and catfish using only their hands, circa 1987. I can't be the only one who does this. Chips on the sandwich. Y'all are so great at figuring out what my things are. So how about this nickel sized piece? My aunt found this in her yard.... three nuts to a pod, what is it? Help IDing this insect around my shower. More info in comments. Does my Morgan have a double date, or is the tone just creating the illusion? Can someone explain this for me? Details in comments. You always come through for me, what did this go to? Found our first gold today! Found this in a roll of wheat pennies. It's been cleaned, yes? Is this a S over D, or just a grease filled die? Any value other than face? What is this? Smaller than a dime, not magnetic. Help IDing this button. I can't make it the letters. Found in VA.
Metal bar... What was it for? Help me ID and date this button? Any way to know what this member pin/badge is from? Why is this 1863 Indian Head Penny I found today so much thicker than the 1907 I found last week? Found this metal detecting today. Is it play money? Or what? About the size of a half dime. And what's the deal with this tiny kettle thing? Part of a play set or maybe cane with a figure? Is this a Native American horse symbol? What exactly do I have here? Obviously it's from something to do with Opera Paris, but what is this exactly? Proofs are only done in Philly right? Is the dime on the left just super clean? It really stood out in the roll.